Two separate bears sightings were made in early July. The first in Lenk and the second a few days later on the Sanetsch. Although there have not been any further signs of the animal, local authorities ask that the population exercise caution. According to the Economic Directorate, a bear was spotted in Lenk in the Siebenbrunnen area on Wednesday, 4 July. The Coordination Office for Predator Ecology and Wildlife Management (Kora) confirmed on the basis of a video that it was indeed a bear. According to the assessment of a gamekeeper, a calf found dead in the area had not been torn by a wild animal. It is unclear whether the bear seen in Lenk was M29, a bear that has already been seen several times in the canton of Berne. Just a few days later, bear tracks were found on the Sanetsch. It is very likely that this bear is the same one that was spotted on in Lenk on 4 July. The beautiful hiking weather over the 7 July weekend attracted many people to the mountains, including Daniela and Ernst Burri-Tauss from Feutersoey. 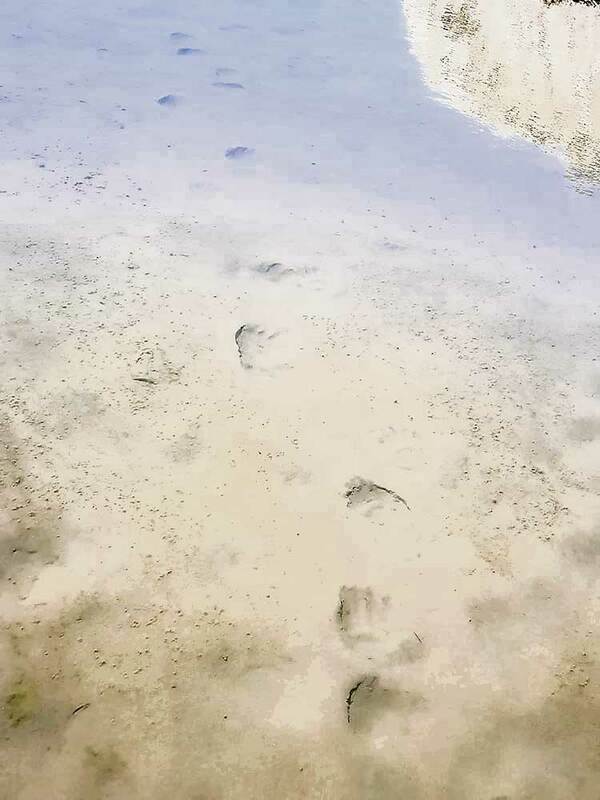 While busy photographing groundhogs, Daniela Burri-Tauss unexpectedly discovered bear tracks on the shore of a small lake. “We were pretty sure they were bear tracks,” she said. Ironically, a day earlier, they had talked to friends about the bear that had been spotted at Lenk and wondered if it was still wandering around. The Burri-Tauss’ had certainly not expected to get their answer first-hand the very next day. On the following Monday morning, Daniela Burri-Tauss reported her discovery to the local gamekeeper. The report went on to Kora and from there to the Department for Hunting, Fishing and Wildlife in Valais. “They contacted me and I described exactly where I found the traces,” said Burri-Tauss. The gamekeeper was able to check and confirm the traces on the spot that very evening, the Valais cantonal authorities wrote in a press release. Burri-Tauss later learned from the media that what she had found were in fact bear tracks. Although no further bear sightings have been made, it is unclear whether the animal is still in the area. The authorities write that the gamekeeper continues to monitor the area. Bears are generally very shy so the likelihood of seeing a bear in the wild is low. That said, bears are wild animals and in the unlikely situation of an encounter with a bear, extreme caution is called for. In addition to exercising the rules of conduct outlined here, the Hunting Inspectorate asks people who have seen a bear or detected bear tracks to call 0800 940 100. – Find out about the possible presence of bears. – Stay on the trails. – Avoid dense berry bushes or remote mushroom areas. – Make your presence known by speaking loudly. – Do not leave any leftover food or waste. – Keep your dog on a leash. – Stand still and calmly assess the situation. – Have your presence acknowledged by speaking as calmly as possible. – Do not attempt to approach the bear. – Retreat slowly (never run, bears are much faster than you). – Avoid anything that the bear might see as a threat (waving a stick, throwing stones, screaming, etc.). – Never attract wild bears with food. – For your own safety, do not take a selfie with the bear. – Never follow a bear that is retreating. – this is not a threatening gesture. – Stop and make your presence known by speaking as calmly as possible. Do not leave any waste; feeding prohibited! – Never feed a bear. – Do not leave any rubbish or leftover food on your hike.